This spring, senior Isaac Burnett completed his second and final season of club track at Barclay College. Burnett was instrumental in starting club track in the spring of 2016 and representing Barclay College in several track venues across the state over the last two years. 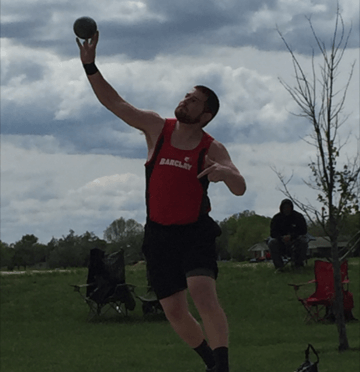 This season Burnett threw the shot put at three different meets in Kansas. At a Sterling Invite (Sterling, Kans.) on March 16, Burnett hoisted a personal record throw of 12.47 meters, which was good for third place. On April 15 in Newton, Kans., Burnett once again threw a personal record at the Bethel Invitational. His throw of 12.71 meters qualified him for the finals at a meet that featured multiple NAIA and junior colleges from across the state. In addition, Burnett also competed at the Tabor Invitational (Hillsboro, Kans.) on April 22. The Barclay College athletic department hopes that the energy and effort Burnett put in over the last two years gives the program momentum to grow and become a staple part of athletics at Barclay in the near future.